Have you followed our LeadAbroad Facebook page? Well, you should, because Social Media Intern Hilary Rattikin posts insightful articles, action-packed videos, and take-me-there-now photos each and every day! Hilary is a junior advertising major at the University of Texas at Austin, and we’re excited to introduce her as our new Social Media Intern, running our Facebook page! 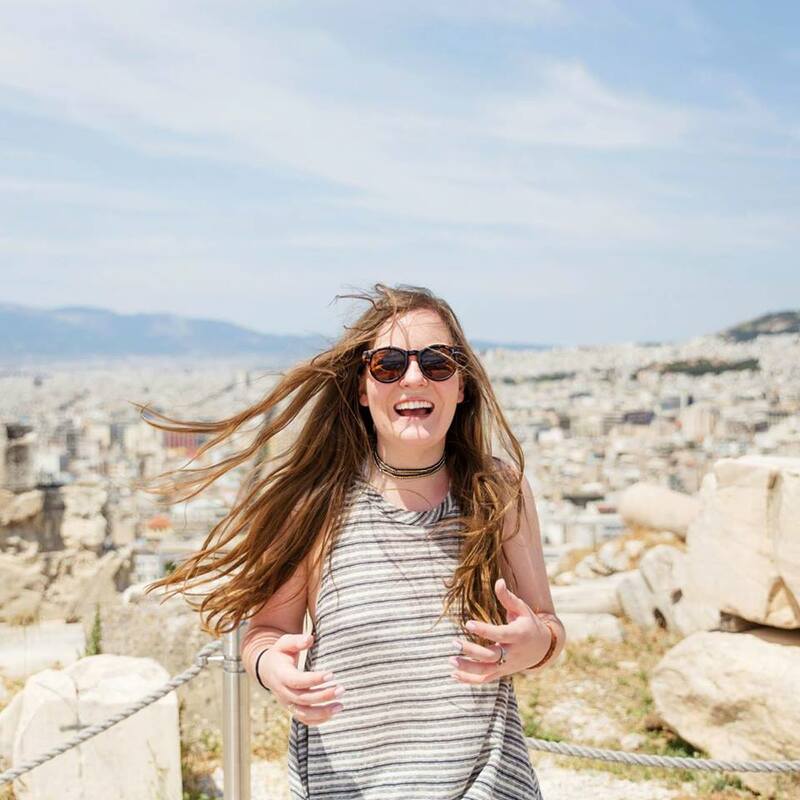 She joined us on LEAD Greece 2015, and she’s super excited to remain involved with LeadAbroad this school year. Read our exclusive interview with Hilary below to get to know her! LeadAbroad: At what point on your LeadAbroad trip did you realize you wanted to stay connected to the organization? Hilary: As our trip was drawing to a close, I started to realize I might never see so many of the people that I’d gotten so close to throughout the trip. I knew I wanted to stay involved and I definitely wanted to stay connected with the staff. When Peirce and Kelsey mentioned the social media internship I knew I had to apply! LeadAbroad: What is the coolest part of your Social Media Internship with LeadAbroad? Hilary: I love being in constant communication with such an awesome team. The staff and interns all bonded as a group during our retreat in Atlanta so it’s great to stay connected with everyone through weekly meetings! Our team is constantly posting motivational posts on Facebook and supporting everyone through social media; its such an enriching and personable community. LeadAbroad: What do you hope to achieve through running the Facebook page this year for LeadAbroad? Hilary: I hope I can continue engaging and building our audience while connecting with past and future students. The Facebook page is such a cool intersection between people from past trips connecting with friends and reminiscing through old pictures and new students looking to see what LeadAbroad is all about! LeadAbroad: What was your best memory from your trip this summer? Hilary: It’s hard to pick a single memory considering the range of things we did. I of course loved the adventure element; bungee jumping over the Corinth Canal is something I will never forget. However, I think my favorite memory might be from our last day. The morning before we left Crete, Kelsey, Pierce, and I got up early to grab coffee and walk through the small side streets behind our hotel. We explored, took photos, chatted with locals, talked photography, and reminisced on our trip. It was a great way to wrap up such an amazing month and talk about how far we had all come. LeadAbroad: What got you interested in social media? Tell us about your experience. Hilary: I’ve always used social media to connect with family and friends. However, in the last few months, social media has taken on a new meaning for me as I’ve attempted to use these platforms to begin building my own photography business. I’ve loved how social media has helped me create a brand, build an audience, and connect me with so many people I would have never met. I’ve loved learning more about analytics to increase optimization and engagement. Social media has been a great way to connect with friends who want to stay updated on my work as well as market my business to potential clients. Hilary: Do it! There are so many different ways to stay involved! Ranging from being an ambassador, community leader or intern, to going on another trip, to just staying involved with LeadAbroad through social media, there are so many options that meet different levels of time commitment. The LeadAbroad family is always connected; we have group text from our trip that we still talk in every day! Hilary: Get a dog. Seriously, that is my main priority right now. Hopefully I will get to work in a field that utilizes photography, advertising, graphic design, or something creative. But first and foremost I want to get a dog. LeadAbroad: Your dream travel destination. Hilary: Well my answer to that question a year ago would have been Greece without a doubt. But now it might be South Africa. Or Ireland. Or Tahiti. Or all of the above. I can’t choose! LeadAbroad: What do you love most about working with the LeadAbroad team? Hilary: The entire staff is so positive and uplifting. I’ve never met a group of such personable people. They are constantly reaching out to us and checking in or posting motivational quotes and advice on our Facebook page. Their dedication to this company, their students, and their mission is so inspiring. LeadAbroad: Describe your LeadAbroad experience in one word. If you haven’t already…go like us on Facebook to keep up with all of the great finds Hilary has coming our way! Stay up to date with all things LeadAbroad and travel.